I've not used angels in anything yet, but am not opposed to it, depending on the story line. I wrote a play with angelic intervention. Well, it was more like a skit. Anyhow, the angel was sunject to what God wanted and his purpose was to reveal God's plan of salvation. But my main character never sees the angel. As far as books go, I haven't written in any angels. I've read a few books where angels are mentioned but none that focus on them as main characters. I have mentioned angels in two of my stories but more as a questionable possibility to for the MC. Thanks for weighing in on the subject. Have a great day! If you've ever read any of Frank Peretti's novels, he uses angels quite a bit. His early books dealt with spiritual warfare. I enjoyed them, but it's not the type of fiction I write. To me, angels guide or inform, like they do in the Bible. They also fight demons, and in that case will be helping us in our plight. Most of the time, God asks us to go through a process of overcoming, and our characters should have to go through process too. I think M. L. Tyndall had a scene in The Redd Siren where the heroine's sister was being protected by an angel or something supernatural. I liked that addition to the book. It showed the supernatural at work. It fit because evil was a work, and it showed God's protection. Short scene, but poignant. Thanks for your input. I agree that the characters need to grow and mature. Thanks for the example. I haven't read that book. Without getting into a long, theological discussion, I believe we'll be surprised at how much angelic protection we've had during our lives. My WIP's MC could sure use and angel... but that would change the ending drastically! I love angels in literature as long as they are working for good. I don't like bad angels or arrogant portrayals of angels. LOL! A lot of our characters could use a little help from angels. Unless the novel is a Frank Peretti-type story, I prefer a light touch. Too much of a good thing causes the focus to switch from the characters to the angelic helpers. I actually had a scene in The Frontiersman's Daughter that dealt with a supernatural occurance but took it out. An early reader complained (she liked it and was sorry to see it go) so I inserted something similar in my 3rd book. I hope it works! Great, thought-provoking question, Susan. How interesting the reader was upset you removed the supernatural occurrence! Most readers don't seem to have a problem with these references. I'm not a fan of angelic intervention in fiction. I'd probably still read it, but I'm more of an angels-in-the-background kind of gal. Thanks for stopping by and commenting. Always nice to see you. I think it can be overdone and become more a story about angels than people. Still, it doesn't bother me as long as it's accurate and done well. A couple of weeks ago, I reviewed Dr. David Jeremiah's angels on my Book Readers Central blog. Some review books I don't keep, but this one has a permanent place on my shelf. I highly recommend it to anyone writing about angels. I agree with you on your thoughts of angels. They definitely throw a supernatural twist onto things. You made another good point. Supernatural rescues must be part of the story, not contrived. The writer must walk a fine line with supernatural doings. Too much and they run the risk of moving into a different genre (Christian speculative fiction). I've heard of Dr. Jeremiah's book. Billy Graham also wrote about angels years ago. Thanks for bringing this resource to our attention. I'm with you, Susan. They are beings sent by God to help us, not to be adored. I've read a couple of books re: angels, one fiction and one nf. The fiction one was way out there, and I was not impressed. The nf, "Angels on Assignment" I found fascinating. Oh, MYYYY, Susan! My next release grapples with this issue. Will be interesting to see what the editors do with it. I kinda left it open for interpretation. Can you BELIEVE we are studying this tonight in our Beth Moore Esther study!! Talk about God's timing. You put together such interesting posts! Oh wow! I think I'm with you on this Susan. I definitely think it's a cop-out for writer's to get their characters out of a jam by having angels come to rescue them. Although I have to admit, I don't read much speculative fiction, so this could be done well in that genre! Thanks for your input and the title of the non-fiction book on angels. If we're going to include angelic beings in our fiction, it's a good idea to do the research. LOL! I was expecting a comment on the post. Thank you for the birthday wishes! Nice surprise. I'm having a lovely day. Your take on angels agrees with mine exactly. 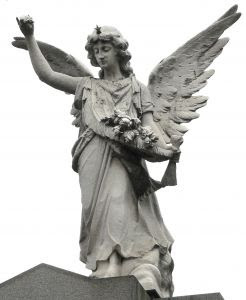 Wouldn't it be fantastic to write "realistic" fiction using an angel to help someone. In third world countries, there are tales of angels doing wonderful things. I love to hear about them. In fact, believe it or not, my daughter saw an angel when she was young and ill. Yes, I think I'd like these stories. You have me intrigued about your book. Please keep me posted. There's no doubt God uses angels. Most of the time, I think we're oblivious. Christian Speculative Fiction sometimes incorporates angels. I enjoy those stories (within certain parameters). If they appear in other genres, I prefer they don't overwhelm the main story. I haven't used angels in writing, but I have played around with the supernatural in inspirational writing. Yes, supernatural doings can certainly include more than angels. I've got a smidgen of it in my second manuscript. I'm trying to think of a book that I've read where an angel came to the rescue and for some reason I'm drawing a complete blank. I do agree with you though, Susan, that praying to angels or glorifying them above God is an abomination I won't read or entertain in any way. Thanks for joining the discussion. Frank Peretti, Tamera Alexander, and Angela Hunt have all incorporated angels in some of their stories. I hasten to add I didn't find any of them objectionable. As I said, I don't have a problem with using angels as long as they're not elevated to an idolatrous position. I haven't written anything with angels because I don't want to do it wrong.